Grocery distributor A.F. Blakemore Logistics has implemented a dynamic routing and scheduling solution from Paragon Software Systems resulting in a one million kilometre reduction in delivery miles. The switch from fixed route planning has other benefits too, including lower overall emissions and a 10% reduction in the fleet, which now only requires 140 vehicles to service 978 SPAR stores across England and Wales. 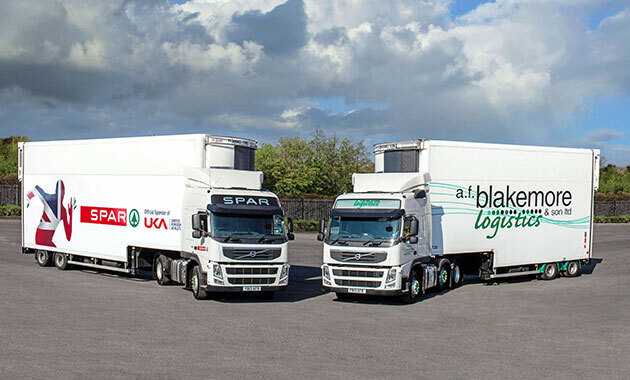 Blakemore Logistics, which forms part of the A.F. Blakemore & Son group of companies, decided to extend its use of Paragon transport optimisation software from pure fixed route planning use to full dynamic daily route optimisation. At the same time it also included Paragon Route Execution enabling it to integrate its Blue Tree Systems R:COM Fleet Management System with its route planning and allow the logistics team to compare actual delivery activities against the optimised plan. This allows the company to alert customers of delivery ETAs using text messages and communicate with drivers. The system also provides timed reporting with updated ETAs for customer services and management teams so that they can monitor and manage delivery performance. The company is also using resource management functionality within Route Execution with the unique Tachomaster Link module. This enables the electronic tachograph data to upload directly into Paragon, which has eliminated the need for keying in the information. A.F. Blakemore uses Paragon to improve the process of managing drivers and vehicles. This integrates with its transport planning system enabling the schedules to match specific driver shifts to available vehicles. It also enables the logistics team to monitor historical performance in relation to drivers’ hours regulations, such as the European Working Time Directive. “Our delivery volumes can fluctuate by as much as 30% on a weekly basis. This dynamic system enables us to effectively accommodate these changes more efficiently whilst achieving significant benefits. Corporate responsibility and minimising our environmental impact is paramount and is a key value of our family business. When we made the decision to change from a fixed to a dynamic planning approach we decided that we were going to commit fully to Paragon technology and we are enjoying the results.